In part 1 of this article, we saw that our sense of purpose stems from deeply held beliefs and impulsions. These essentially are twofold. There’s the opaque yet innately intelligent impulse we have to reach psychological well-being by resting contentedly with life’s circumstances. There’s also the erroneous belief that only through pursuing self-interested desires is this same contentment reached. So this impulsion to attain a psychological and emotional well-being is corrupted by self-interested measures that seek gratification of the senses in intermittent spells of pleasure and happiness. Although our innate intelligence is directing us to a more fundamental and enduring contentment, we find it all but impossible to resist the allure of short-term gains. Because of this, we think happiness is what we seek in life. This false assumption seems perfectly reasonable to us, and as we may experience degrees of happiness frequently, then we appear to be guiding ourselves wisely. So there’s a conflict of interests going on here. On the one hand, deep down we know that only by ending all desire are we able to feel contented. On the other hand, we find pleasure and happiness irresistible and so pursue them by means of our desires. We strive after the objects of our desires in an endless succession of objectives. We strive towards fulfilment in family life or relationships; we strive towards attaining prestige in our career or personal interests; we strive towards security in material wealth or physical health. All of this ceaseless striving issues from a misguided self-conception which subverts and acts contrary to the interests of our innate intelligence. Maybe it’s time to step back from all the striving, to look at the historical evidence and see if it all stacks up; to evaluate if it’s really working. In doing so, what we may find is that at best we can claim a partial success. We have spells of happiness, and experience many pleasures and gratifications; but to what extent do we feel any enduring sense of contentment which itself is the fundamental purpose of the striving? If it’s the case that our experiences of contentedness are less frequent than those of happiness or gratification, then things are out of balance. We’re settling for these fleeting and hard to quantify states, which in any case are subjectively dubious: ‘Am I happy? Well, sort of; reasonably so; can’t complain’. This is often all our conception of happiness amounts to; it’s far removed from any condition of resting contentedly with life. So all of this desire with its attendant striving isn’t producing what we need. It’s not giving us what our innate intelligence is attempting to guide us towards. And this is because the self-entity – the narrative conception that we wrongly believe represents ‘me’ in actuality – is controlling matters from its own false perspective. It’s this false belief that initiates self-interested desires and which fails to bring contentment. The solution to this predicament rests in a deconstruction of the narrative that comprises the self-entity. In so doing, we progressively move towards connecting authentically with our being. This means the overlay of selfhood is gradually whittled away; the narrative is no longer threaded together; it’s no longer believed to correlate to the actuality of our being. We see the whole edifice was always duplicitous. We’ve no need to give up on working purposefully towards any goal. What’s given up is the heated, self-interested striving which merely hinders matters such that we end up exhausted, stressed and anxious. Taking the self-entity out of the picture, if only by degree at first, allows us to work more efficiently. This is because the attachment to any outcome dissolves and we’re able to progress free of draining concerns. In deconstructing the narrative of self-entity through contemplative living, our sense of purpose is finally able to extend to us the psychological and emotional well-being our innate intelligence sought. Along the way, we find that life progresses more smoothly and that the stress and anxiety produced through our former heated egoical striving simply evaporates. Our sense of purpose is now free to meet its true ends. Have you any specific advice for me here about painting? Can I somehow continue to paint without the hunger to be seen, appreciated. Without striving for a market? My fear is that somehow the energy and excitement and strength of my work is inseparable from desire; that if I am patient and content there will be no work. I wouldn’t dream of offering advice about how you approach your creative work Liz, which in any case as a professional you’ve no need for. And besides, I’m not in any way qualified to comment upon this. So none of what follows is directly specific to that. If I may say so, your words might suggest that you’re conflating the creative process with matters of your identity as a narrative construct: the story of ‘me’ which is ‘Liz the painter’. This is very easily done of course, by all of us. We slip imperceptibly into inhabiting our own self-narrations, assuming them to correspond to our moment-to-moment actuality. That actuality, as you know, is never more than the sensory representations presented to awareness. The ‘inhabitation’ of the story operates as a conditioning assumption that affects thought and action. At a guess, I’d say you don’t work creatively out of any prideful egoic motivation – many do, but you don’t; I’m pretty sure of this. Neither do you work creatively out of fear or desire – creativity can’t possibly be driven by these things, though they may add a sense of urgency to it. This means your work – the unfolding creative process itself – is very largely untethered to these things. So there’s your assumed identity as ‘Liz the painter’ which generates fear, a desire for appreciation, and which believes it must engage in order that you may strive for your worldly needs. And there’s painting, or the creative process itself, which issues through your body and mind but is of a different order to an assumed identity as ‘Liz the painter’, that being a narrative construct only. In conflating the two, they appear co-dependent and inseparable. The fusing together of the two creates a ‘con-fusion’ in which the two processes become indistinguishable. You know this already I’m sure – at a conceptual level I mean. At an experiential level, the knowledge gets lost in the ‘con-fusion’. There is nothing ‘Liz the painter’ can do about the creative process, except hinder it. So the entirety of any remedial work consists in deconstructing ‘her’ as an assumed identity, and as a story that inhabits your mind in belief. This is what I meant when I just said ‘you know this already’ (conceptually). And you do – right? Feel free to continue with this if you wish, or tell me I’ve got it all wrong Liz. Dear Hariod, My garden requires more of my time than I can give it, and it would thrive under the care of someone who knew more what she was doing than I do. But, no-one could care more than I do. I’m satisfied, more or less, with providing what I can, and yet, I cannot feel contented about giving less than what my dear plants seem to require of me. There is a gap between being satisfied and feeling contented, at least in my life. I experienced this same feeling while caring for my family, and now I also feel a gap between what I would if I could give to Spirit and what I can. It seems to be a personal characteristic of mine, and yet, there can be no characteristic of my own that everyone else does not possess, at least potentially. If that were not so, how could there be oneness? We are surely all the same except in degrees of quantity of specific qualities, and not in anything that no-one else does or can possess. So, why can’t I be an artist? Something in me cries out to express itself in watercolour. My easel stands, covered, and waiting, for what? A future lifetime’s share of talent? It seems Jean, that you’re one of the few individuals who sense what you call this ‘gap’ between a more-or-less acceptable degree of satisfaction and what could be – what I choose to call ‘contentedness’. You’re correct in positing that this sense of lack is innate to the human condition (orthodox Buddhism refers to it as ‘dukkha’ as you may know). Typically, we attempt to fill this sense of lack with short term gratifications – such as states of happiness and in material acquisition – and in pursuing notions of ‘becoming’. That is, we strive to become some ideal projection of ourselves. Perhaps the most intense and widespread example of this attempted ‘becoming’ can be seen in those engaged in spiritual seeking. At the end of that road, it’s seen that the seeking itself is the final obstacle, that the ‘gap’ closes by itself if only we allow it to, and that the garden is perfect just as it is. My very best wishes to you Jean, Hariod. 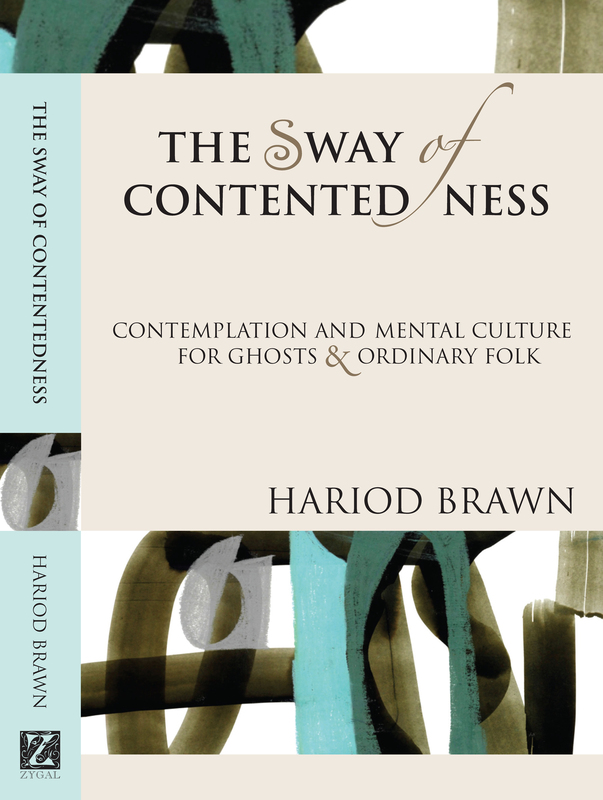 A beautiful article — contentedness is a virtue and blessing, indeed.